Located on the island of Djurgarden, the museum displays the only intact 17th century ship in the world, the 69 meter (226 feet) long warship Vasa that sank in 1628 on her maiden voyage in Stockholm. Loved this museum. The story of this ship and what efforts have been made to preserve it are so interesting. It&apos;s a must-see in Stockholm. This was another highlight of the cruise seeing the old ship that sunk in the 1600s on its maiden voyage. Also lunch was very enjoyable which included Swedish meatballs. The Vasa Museum was the best part of this excursion. Vasa is a don’t miss museum. Vasa is a don’t miss museum. An incredible restoration with great explanations and visuals. Not enough time at Vasa Museum. Not enough time at Vasa Museum. Did enjoy countryside at Signa. Again had 40 people - no audio devices.But guide repeated what she said in the bus so all could hear. We walked up to buy tickets and joined one of the tour guides. We walked up to buy tickets and joined one of the tour guides. A "must see" when in Stockholm. The Vasa Museum was wonderful our HAL tour guide was not so good. It was interesting to see the ship on the Museum and learn about it. Good overview of the city and sights. Our booked tour included both the Vasa Museum and the City Hall. 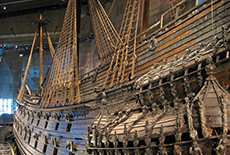 The Vasa museum is a don&apos;t miss attraction. Vasa museum is amazing. Lots of information about the ship and its crew. Fully preserved wooden warship. Highly recommended! Wonderful tour of the city and I thought the Vasa Museum was the best I have ever visited in terms of education and comfort. Then toured the city and walked around. I loved Stockholm and would like to visit again for a longer period. The Vasa Museum was AWESOME, the highlight of the trip for me. The Vasa Museum was AWESOME, the highlight of the trip for me. The rest was mostly a bus tour of the city. We did not go in any buildings Stockholm was a beautiful city and I would love to go back. I took the hop on boat from the dock to the museum. I took the hop on boat from the dock to the museum. Easy to do, and the museum is awesome. Watched the movie and took an English tour. Such a cool place. We did the Skyview and Vasa. We did the Skyview and Vasa. The skyview was great but everything else was too rushed for our liking. This ship is amazing, needs to be seen. This was excellent would recommend so much information and such a great day.